What says summer more than a clambake? NOTHING! Well, maybe BBQ chicken, ice cream, popsicles, hamburgers, hotdogs, corndogs, corn, tomatoes, strawberries, blueberries, s'mores...you get the picture. 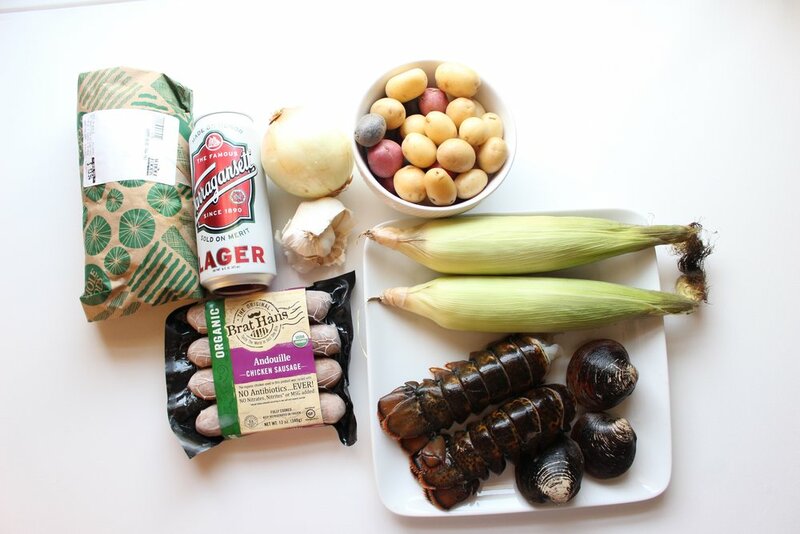 But, clambakes are pretty darn summery. And did you know how easy they are? Super easy. We've been using Martha Stewart's method for years and it's a pretty no-fail recipe as long as you cook things in the right order. However, Martha's recipe is HUGE and requires an extra large pot, which we don't have. Also, there are only three of us. So, I've scaled this one back and added some more tips to make sure you aren't overcooking any of the seafood. Also, this meal is so so quick to prepare and easy to clean up, leaving more time for all things summer. - Feel free to sub in water or stock instead if you want to avoid alcohol. But rest assured that the booze cooks out with the heat AND, the beer is only there for flavoring in the steam; You aren't actually eating it. - Use the smallest potatoes you can find. If you have even golf ball sized potatoes, I would halve or quarter them to ensure that they cook enough. - Clean the clams or mussels well. I like to put them all in a large pot of cool water a few hours before we cook them to let the shells open to release the sand. - Swap in mussels for the clams or use a combination of both, but only use 1 lb. You can also use scallops, squid, or octopus in place of, or in combination with, the shrimp. I don't always love steaming those three because there's a thin margin of error for overcooking and turning them really tough, but if you like their flavor, go for it! But also use a total of 1 lb with those or a combination. - Don't skip the garlic butter for serving. This recipe is great without it, but the garlic butter takes it right over the top. - For a dairy-free option, use clarified butter instead of regular butter. Add the potatoes, sausage, and lobster tails to the steamer. Cook for 5-6 minutes until the shells start to turn orangey red. Add the clams (or other hard-shelled seafood like mussels) and the corn. Steam for another 6-8 minutes until the shells open. Discard any shells that remain closed. Add the shrimp (or other soft shelled or de-shelled seafood) and cook for about 4 more minutes until the shrimp is pink all over. While making the seafood, melt the butter in a ramekin and add the chopped garlic and parsley (if using). Stir to combine and set aside. Dump out the seafood, veggies, and sausage onto a large, parchment-covered sheet pan. Sprinkle with old bay seasoning to taste. Serve with lemon wedges, extra old bay, and garlic butter. Yield: A lot. This recipe comfortably feeds 2 adults and 2 kids, likely with leftovers.